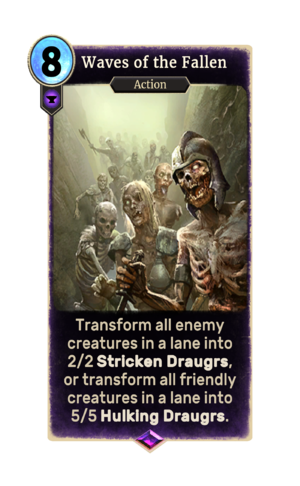 Transform all enemy creatures in a lane into 2/2 Stricken Draugrs, or transform all friendly creatures in a lane into 5/5 Hulking Draugrs. Waves of the Fallen is an epic Endurance action card. It is part of the Heroes of Skyrim expansion. This page was last modified on 24 September 2018, at 23:32.